DriverPack Solution is a nifty program which can find out if your system's drivers and applications require any updates. If so, it automatically downloads them for you, without requiring the user's input. DriverPack Solution Online can find and automatically install Driver Updates for hardware components in Windows. It can check the version information of your existing drivers and check online for updates. You can then easily update to the latest versions. It is recommended to keep drivers up to date as it can improve stability and performance of your system. In other words, this tool finds outdated drivers on your computer. The app automatically performs a scan job on the computer upon initialization, and displays all drivers and programs which have updates available online. Simply select the preferred items and let DriverPack Solution take care of the rest. In addition, you can backup data before making any changes to the computer, test the RAM, perform a defrag task on the hard disks, scan the computer for viruses, access the Device Manager and Add or Remove Programs in Control Panel, as well as make DriverPack Solution hide confirmation dialogs and save logs to the current folder. The program is designed to be used by anyone from home users to system administrators, offering you an easy, quick and efficient way of installing the correct drivers for the devices attached to your computer and then keeping them up to date. This software also has the widest range of support, covering all sorts of devices including USB devices, PCI, ACPI, PNP and much more. When you start using the software, the driver installation process will be fully automated, and since it already contains a comprehensive database of drivers, you don't even need to be connected to the Internet at the time. 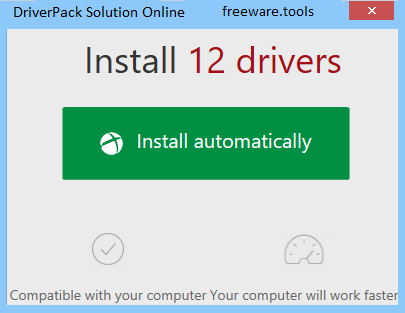 Driver packs contain 1,131,989 manually selected and tested drivers. The updating task can take a long while to finish, and the app does not allow you to cancel it. It has a good response time to key commands and mouse events, and includes user documentation. DriverPack Solution does not crash or display error dialogs. DriverPack Solution comes equipped with some powerful features, and is oriented towards users of any level of experience.